First things first, a lot of people will doubt your judgment of buying ruby rings instead of the more popular diamond ones. The fact is that the well designed ruby engagement rings are sometimes even more luxurious and popular than the usual engagement rings. You should first know everything about rubies used in the rings. Here is a look at some important facts. Rubies are basically gemstones belonging to the corundum family of gemstones. They are usually red in color. The red can either be deep crimson red or of any other shade. If the color of the stone used in the ruby rings is not a shade of red than the gemstone is just a sapphire, not a ruby. Rubies are so actually hard, second only to diamonds, so there shouldn’t be any cracks. You should see to it that the rubies used in the rings should not be very clear. There should at least be some minor inclusions. Most of the times, the rubies are heat-treated in an effort to improve their color. You should check this with the seller beforehand. Like a diamond the rubies’ cut is also very important. 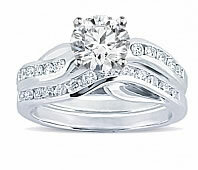 The excellent and the most popular cuts are the oval and the cushion cuts. Also the origin of the rubies plays a vital role in deciding the price of the ruby rings. The most costly rings usually boast of the Burmese rubies. Most of the people frequently complain that the ruby engagement rings are very expensive and there is no scope to save some money. Well, if you try then you can simply save some money when you set out to buy the ruby gemstone engagement rings. The easiest way is to simply buy the ruby rings with rubies that have a somewhat off-shade. The shade can be somewhat darker or lighter than the perfect red color and it would not make a lot of difference. The fact is, nobody will even notice the difference in the shade unless they pay a lot of attention to the ruby’s color. So now that you know everything you should about the ruby engagement rings, contact Novori Jewelry for personal assistance in creating the perfect ruby ring. We have created hundreds of ruby rings and can create a masterpiece for you.